When I was asked to write about Goddess and my journey with Her I was like: YES! So many ideas, so many thoughts. But where to start? Goddess has been a part of my life for over 20 years, which means that so many things about Her is like breathing. I will do my best to share my experience of Her with you. She is the creative force of the Universe. You know The Force in Star Wars…? Yep. That´s Her! She flows through every living thing, through rocks and trees. Through the stars and the sun and the moon. She is One Goddess with 10,000 names. You may have heard of some of them? Freja, Inanna, Kali, Ariadne, Artemis. All different aspects, or faces of One. Just like you and I may be slightly different at work, on the bus, at home, with our children, at an interview or when we are out with our best friends. We all have many aspects, and it is the same with Goddess. My journey with Her started in my late teens when I suddenly realised that there were others out there that had the same feelings and experiences as I had. I remember the first time I heard a shaman in ceremony talking about honouring Mother Earth. Wow. Another magical moment was when I first moved to London at the age of 19 and finding Watkins bookshop! Oh my Goddess! They had a whole bookshelf with books on Goddess and witchcraft! I did not make a lot of money, but I saved up for a book called Earth Magic by Margaret McArthur, and it was like coming home. It was not a “how to do spells”- kind of book. It was a book that encouraged the reader to go out and feel the elements, experience what air, fire, water and earth feel like, both physically and emotionally. And through a closer relationship with the elements and the land around me I got closer to understanding myself which led to me being able to let Goddess in. When I am open I can connect. And that has been my path ever since. My knowledge of Goddess is from within. From getting to know Her in my body and in my soul. Only then can I open up to Her energies outside of me. After some years back in Sweden and then three years in Australia I came back to London, and at the age of 27 I started my Priestess training with Kathy Jones in Glastonbury. I really had no idea what would be involved, but I felt so drawn to it that I knew it was right. And it sure was. What a journey! During the three years of training we were taken deep down into the cauldron of transformation, and back up again. Several times! It was life changing. Truly. 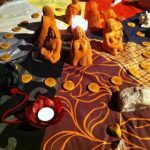 Through getting to know ourselves we also got to know all the aspects of Goddess through the seasons. We learned how to hold space in ceremony, call in all Her aspects, how to find Her in the landscape and how to share our experience with others. It is difficult to explain with words what we learned because it was soul-deep. Goddess is all aspects of womanhood. She is the maiden, the lover, the mother and the crone. She is the playful innocence, she is the passionate woman who knows her own sexuality, she is the caring mother who stands up for herself and her children, and she is the the wise old crone who brings us change and transformation. She can seem fierce at times, but she is always loving. All these aspects can also be seen in the phases of the moon as it grows from new to full. One of my favourite things is being in circle with other women (and men, and everyone in between). 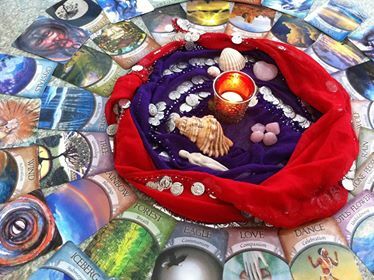 When we sit in circle and share from our hearts magic happens. At the moment my work is mainly focused on creating online courses, but I still love real time sharing with my Sisters. At the moment a lot of people are hearing the call of the Goddess. We are feeling a call to stand up for ourselves and find a way back to our own power. We are called to speak our truth. We are learning to listen to ourselves and our bodies. Honouring and celebrating ourselves. And many people are realising the beautiful all loving power that is available when we open up to, and connect with the great creating force of the Universe, with Goddess. Being a Priestess has always been for me standing with both feet on the ground. Preferably barefoot, or even in wellington boots! Feeling the mud between my toes. Feeling the sunlight, or rain on my face and connecting with nature around me. It is also learning how to stand in my truth, love myself and share what I have learned, or what I am learning. Please, feel free to contact me if you have any questions about what I have shared above. Elin is a Priestess of Avalon and a witch. She runs Lady Sparkle Art, where she offers online courses related to Goddess and mindfulness. She also makes gorgeous colourful Goddess sculptures! 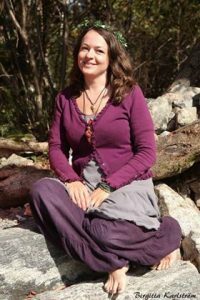 Elin has helped create ceremonies and hold sacred space at the Glastonbury Goddess Conference, at various dedication and seasonal ceremonies, as well as holding workshops at Goddess Conferences in Sweden and in Germany.